To further our efforts to raise awareness of the conflict levels here in Prince George, the following maps have been prepared. After gathering and preparing data from several years, the following map depicts the areas within the city which have the highest numbers of conflict issues. 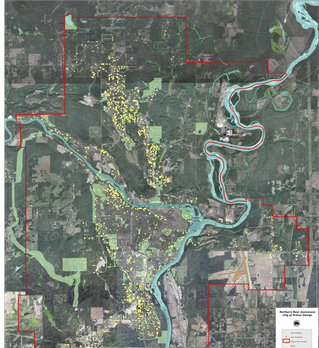 Data provided by Ministry of Environment and Mapping provided by Ministry of Forests, Lands and Natural Resource Operations – Omineca Geospatial Services. On average, the Prince George area receives an average 800 bear complaints every year. Due to unmanaged attractants, an average of 30 bears are destroyed annually. Initially, with the start of the Northern Bear Awareness program in 2000, the number of bears destroyed was reduced; however, the number fluctuates each year due to the amount of natural bear food available and, of course, the number of unnatural bear attractants accessible.